Many customers purchase this test because it covers a wide variety of prescription drugs. Commonly abused medications such as Adderall, Xanax, Valium, OxyContin, and Vicodin can all be detected with this one test. The most widely abused illegal drugs, along with a few somewhat rarer illegal drugs, are also included on this panel. The 12 panel test and the 10 Panel iCup test for drugs that are not found on any other urine panels we sell. Those two drugs are Methadone and Propoxyphene. 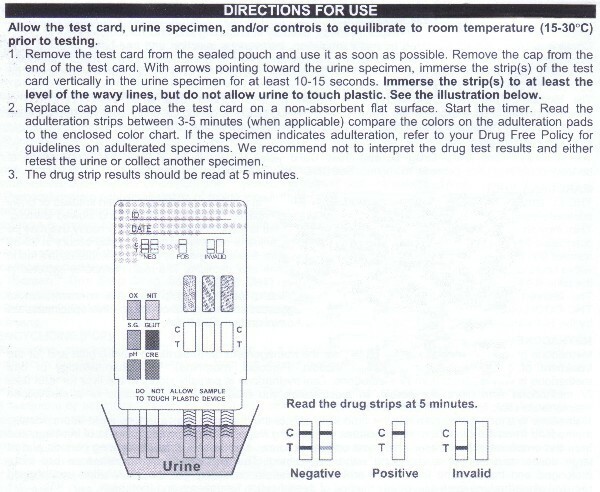 Methadone is exclusive to the 12 panel; the 10 panel iCup tests for Propoxyphene as well. Methadone is a popular drug used to help people recover from opiate/opioid addictions; it can also be abused for a high. Propoxyphene is not as familiar to many, but may be more familiar by its brand name Darvon or Darvon-N. It is a prescription opiate painkiller. The FDA has actually withdrawn it from the market due to side effects that can seriously affect the heart. Q: Is this test FDA cleared? Q: Does the 12 panel need to be disposed of in a special way like a biohazard bag? All drug test devices can be stored at room temperature up to the date of expiration printed on the individual foil pouch. They cannot be stored in extreme heat or cold and must remain sealed in the foil pouch until use. Please do not refrigerate the test and especially do not freeze the test strips.